If any of you want to waste a lot of time sitting at a computer looking at baby bears, here is the site for you! 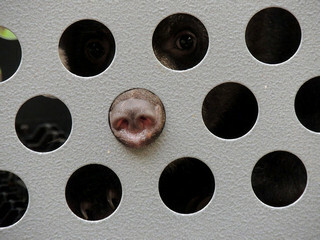 Six orphaned black bears are at the Wildlife Center now. They can be currently seen on Cameras 2 and 3 at the link above. They are still pretty little wandering around in a large area, so they are not always easy for the cameras to find. They are all males, and all came in separately so they are not brothers. People have found them abandoned, lost, or orphaned and called the Wildlife Center where they will have a chance to grow up and learn to be bears before being released back into the wild in the fall. 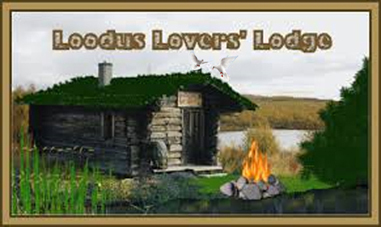 They started out together in a small building where their progress could be monitored easily. They started out having to be bottle fed, and then progressed to eating a soft "mush" mixture out of bowls. They are finally eating "bear food" -- vegetables, fruits, nuts, bugs, etc. so they were moved on Sunday morning to one of the outdoor wooded areas that is fenced in so they can still be monitored. You can see that the Center tries to give them as much learning and enrichment as possible, like they would be learning from their moms in the wild. First stop -- the trees! longer than I planned...no problem, time enough. the Austrian mountains and animals? And did you see the young white tail deer in your garden again? I gave fair warning how addictive they can be. I spent most of Sunday afternoon watching them explore their new temporary home. We have not seen the little fawn since that first afternoon it appeared in the grass. When it walked off on its own, it was headed to the area of our property that is thick with tall grass and quite a few trees, so I suspect that are many deer that pass through that we never see. In fact, the other morning I was driving past and saw a female turkey with a groupd of little ones heading in the same direction. I really need to set up my trail camera to get an idea of what is happening back there. More pictures of the bears' moving day on Sunday. Too cute not to share. Yes, that is my favorite picture, too! It is the little guy with the yellow ear tag. 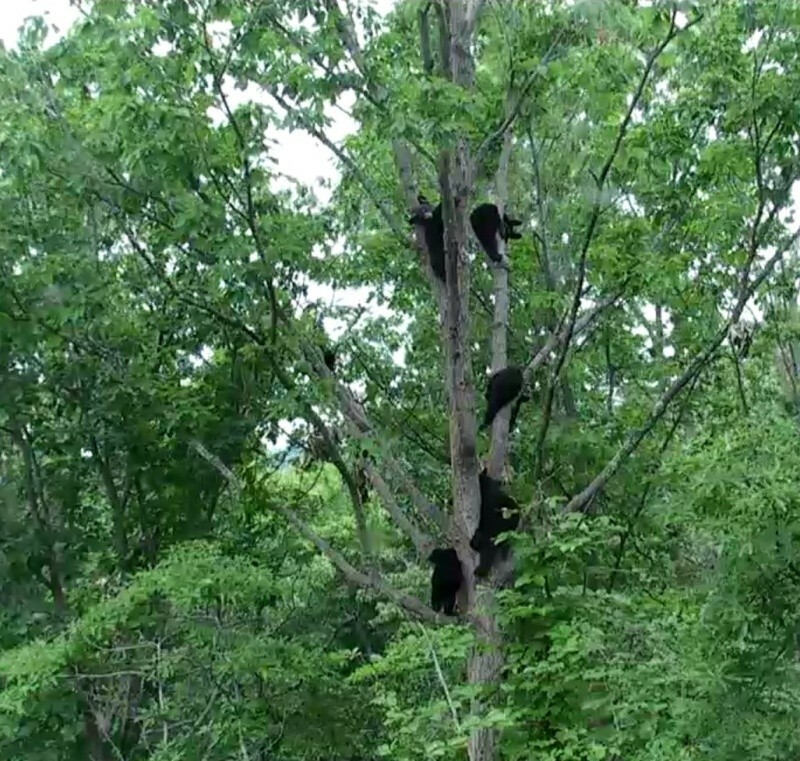 Where did the bears sleep last night? 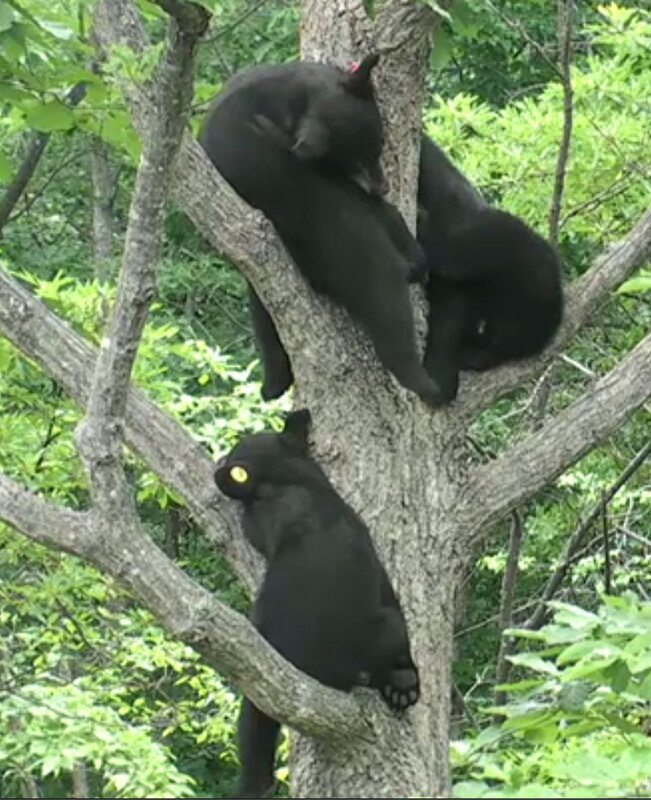 Two weeks have gone by since the young bears were moved outdoors -- and they are still napping as a group in the same tree! 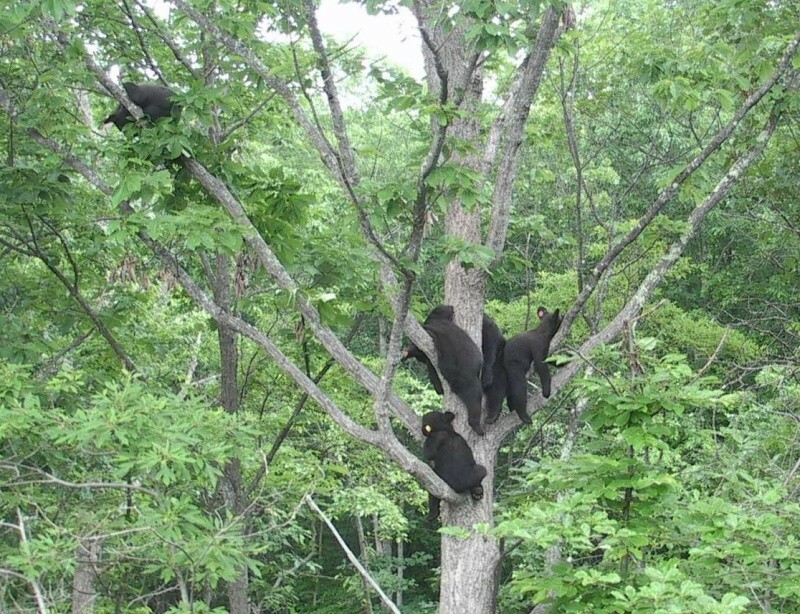 Well, the group of 7 bears in the pictures above are now yearlings and ready to be off on their own. 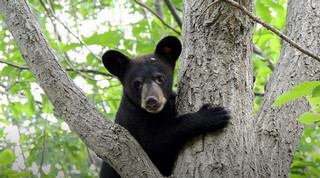 They were released back into the wild in groups of 2 or 3 bears at forest areas in different parts of the state of Virginia. 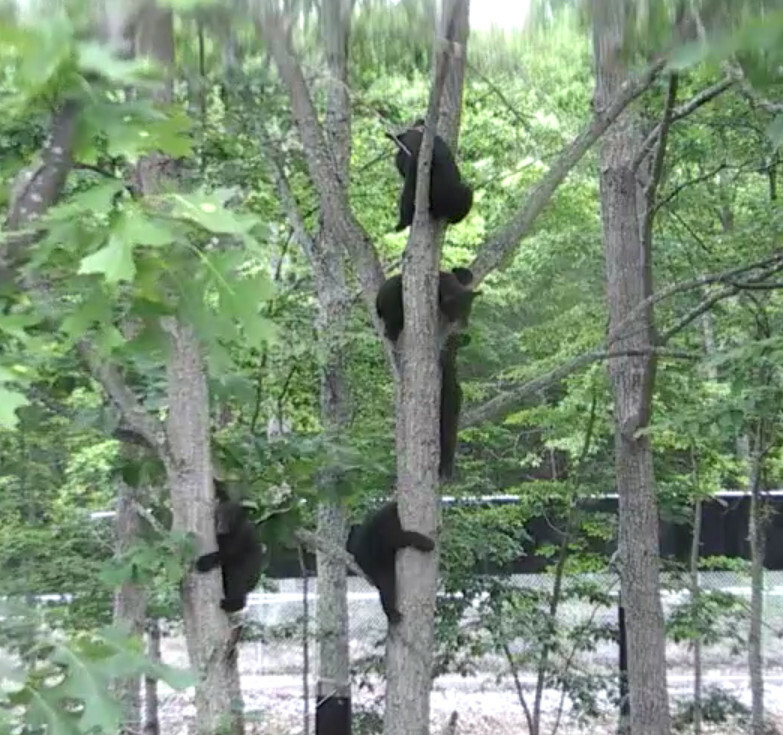 This video is a review of the year from when they started out together as orphaned bears from all different locations until they got their freedom this week. Here is the release of two of them on Wednesday. There is already one orphaned baby bear that was rescued over the weekend and is being bottle fed -- so it will all begin again as more little ones are brought in for help.